Small-Life Supplies breed stick insects in large numbers, concentrating on the harmless species. Pick an enjoyable pet insect to suit your lifestyle. From classic thin, to wide and chunky, these social insects are supplied in small groups. Nymphs (youngsters), or adults, your perfect choice awaits. A free colour information sheet is included. All our stick insects are harmless. 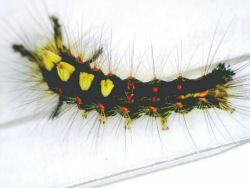 These are colourful caterpillars, very easy to keep, and they have a fast lifecycle. They eat fresh bramble/blackberry leaves which you can gather yourself, or you can buy loose leaves from us. 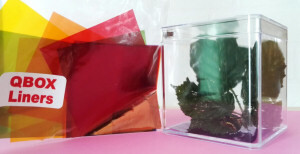 Four caterpillars are included in the kit, keep these in the QBOX supplied and watch them grow! Caterpillars need to be kept in clean surroundings and so replace the QBOX Liner every day or so. You will receive twenty QBOX Liners (assorted colours). A detailed information sheet is also included. Rest assured that that we captive-breed all these caterpillars, we do not take them from the wild. When the caterpillars are 3cm long, each one spins a cocoon in the QBOX and a few weeks later the adults emerge. They are British and so can be released outside in your garden or the park. four caterpillars, one QBOX, pack of twenty QBOX Liners, information sheet...£14.50. Optional extra: small bag of loose dark green bramble leaves £2. British Vapourer Caterpillar on a bramble leaf. The species is Orgyia antiqua. The best type to choose if you are new to keeping stick insects. Indian stick insects are easy to handle, easy to breed, and suitable for all ages. They grow to 11cm. Parthenogenetic (all females). Indian stick insects eat bramble (blackberry) leaves, also hazel leaves. They do best in the tall airy ELC cage. Pack of four Indian stick insect nymphs £15. 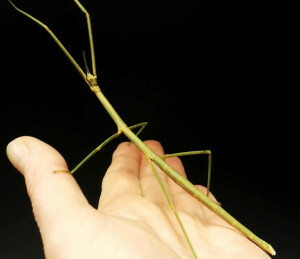 More info in "Keeping Stick Insects" book, price £12.50 (describes this species in detail). Graceful stick insects which get large pink wings when fully grown. They can fly across a room and land on the wall. 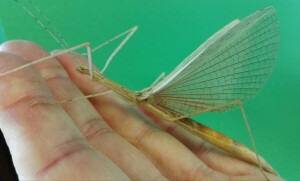 Pink Winged stick insects are easy to handle, easy to breed, and suitable for all ages. They grow to 15cm. Parthenogenetic (all females). Pink Winged stick insects eat bramble (blackberry) leaves, also eucalyptus leaves. They do best in the tall airy ELC cage. Supplied as nymphs, this means they are not yet fully grown so you can look forward to seeing them grow and acquire their wings within the next few months. Pack of four Pink Winged stick insect nymphs £15. Thailand stick insects have both males and females occuring in equal numbers . The females are long and green, the males are much thinner and dark brown. Thailand stick insects eat bramble/blackberry leaves and are active when handled. Thailand stick insects are thin and fast moving, so need to be handled carefully. For this reason, they are not suitable to be handled by young children. Thailand stick insects eat less than many other stick insects and so are perfect for people with busy lifestyles or limited supplies of bramble leaves. Thailand stick insects are easy to breed, they mate regularly and their eggs hatch quickly, after just two months. Keep the newly hatched Thailand stick insects in the same ELC cage as the adults. Pack of four Thailand stick insect adults (two pairs) £15. Pack of four Thailand stick insect nymphs (two pairs) £15. These get to be large chunky stick insects, the adult male has large wings and can fly. 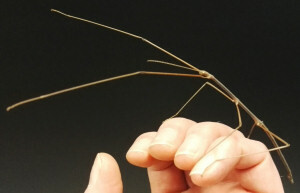 Australian Macleays Spectre stick insects eat eucalyptus leaves and also bramble/blackberry leaves. These stick insects like to curl their tails up like scorpions, but are completely harmless. Australian Macleays Spectre have leafy looking legs and their heads are cone shaped. Supplied as nymphs, this means they are not yet fully grown so you can look forward to seeing them grow and the male acquiring his wings within the next few months. Pack of two Australian Macleays Spectre stick insect nymphs (one female and one male) £19. Want to mix stick insects? If you have New Guinea stick insects, these are best kept in their own ELC cage. Due to their bulk, they can accidentally harm a thinner stick insect if they tread on it. But the other types on this page can be kept together in the same ELC cage. But don't overcrowd them, so twelve is the maximum number (for example, four Indian, four Pink Winged and four Thailand). To pay by PayPal, just email a list of what you'd like to buy and your PayPal email to ange@small-life.co.uk. Do not email your delivery address, this is supplied by PayPal. We shall then email you the invoice which you can pay by PayPal. Educational establishments and companies can email orders to ange@small-life.co.uk. We shall then email you the pro-forma invoice which you can pay by any of the above methods. Business cheques are still accepted. If you need any help in deciding what to order, please phone us on 01733 203358 (weekdays during office hours). We are keen to assist. Delivery Express delivery is by courier to mainland UK (except Scottish Highlands), weekdays only. We shall let you know by email when the delivery day will be. VAT Prices include 20% VAT unless otherwise stated. A receipted VAT invoice shall be sent to educational establishments and companies. Please note that all photographs on this site are copyrighted by Small-Life Supplies and must not be copied or reproduced elsewhere. Small-Life Supplies, Bassenhally Road, Whittlesey, Peterborough. PE7 1RR.